Studio server is a fancy dual-Xeon system with 12 Gb of RAM. Both processors are quad-core with hyper-threading support running on 2.27Ghz. Own hard disk space is only 146Gb SCSI disk (which means it’s superfast), but there’s external hardware disk array attached to this server. In fact, there’re are two raid arrays there: one of them is only 1Tb which is used for day-to-day shared folder and production svn, and another one is 5Tb array used for rendered data. I’m not sure about raid levels used, but think it’s raid-1 (mirror) used to smaller array and raid-5 used for bigger array. It’s a headless server so there’s no fancy video card in this computer. 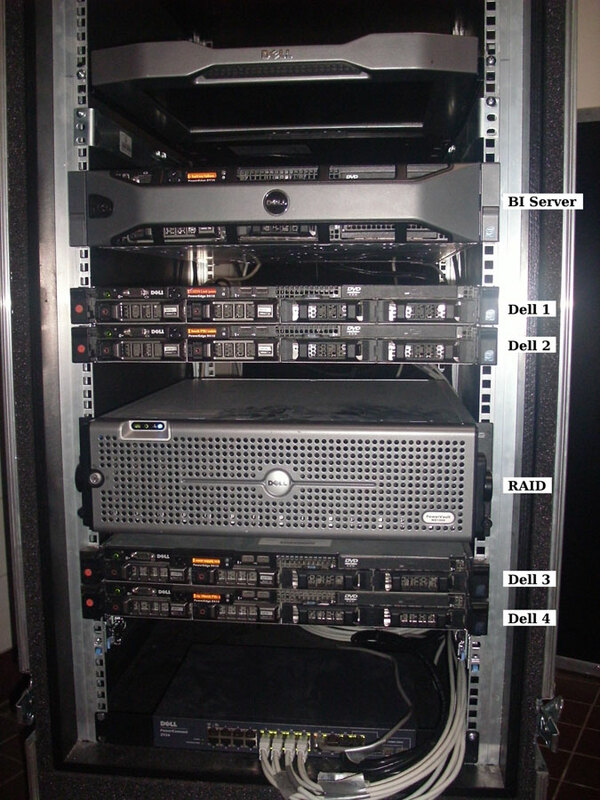 Currently we don’t have justacluster running (probably it’ll be configured this week), so there’s only 4 Dell nodes which are used by render farm. Each Dell node is a dual-Xeon station and it’s also quad-core processors with hyper-threading support and they’re also running on 2.27Ghz. They’ve got 24Gb of RAM and 160Gb space on a SCSI disk. This is also headless systems. Kjartan is using new system delivered to us from HP which is a single-Xeon station, quad-core without hyper-threading running on 3.5Ghz. It’ve got 8Gb RAM and 1Tb haddrive space. This machine has got Quadro 2000 video card. Francesco is also using HP station with the same processor, memory and hard drive, but video card was replaced with 8800 GTS. Nicolo is using station based on Core i7 920 processor which is quad core with hyper-threading support running on 2.67Ghz. This computer has got 12Gb RAM and 500Gb hard drive. This computer has got two videocards one of them is 8400GS and another oen is Quadro 2000 taken from Francesco’s computer. Ian and Sebastian are using identical systems with dual-Xeon configuration. This processors are quad-core with hyper-threading support and they’re running at 2.66Ghz. There’s 24Gb of RAM and approximately 380Gb hard drive. Video card is GTX260. Jeremy is using quite the same computer as Nicolo with core i7 processor but here there’s another video card installed — it is GT220. In the developers room we’ve got two running machines. One of them is dual-core Intel Core 2 system running at 3.0Ghz, 4Gb RAm and video card is 8800 GTS. This machine isn’t actually used at this moment and i hope we’ll collect a bit better configuration here when Brecht will arrive working here. Another system in this room is a quad-core Intel Core 2 system running at 2.66Ghz with 8Gb RAM and the same 8800 GTS video card. We’ve got two separated networks here. One of them is used by computers in the studio and another one is used by render farm. In both cases it is gigabit network and separation is needed to reduce network latency caused by network activity of render farm and artists. To be more fancy studio computers are attached to gigabit switch which is connected to server with 10GBit connection. Benchmark was done using BMW model from Mike Pan which you can find in this blenderartist thread. There were 4 setups: FullHD (1920×1080), HalfHD (960×540) with CPU and GPU rendering. There’s a time taken for rendering by different systems (time in brackets is time of HalfHD rendering). 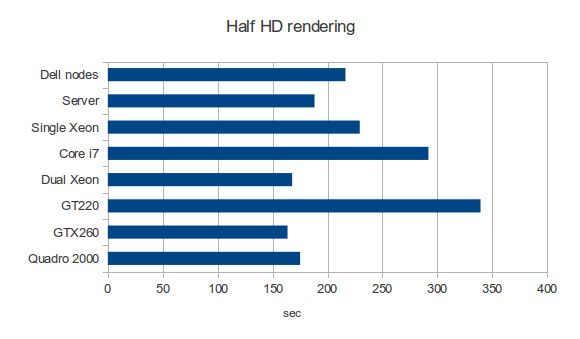 Just in case, note, that benchmark results posted in that blenderartist thread is made for HalfHD resolution. Unfortunately, not. GPU rendering is much faster rendering sample scene like this but we can not render actual scenes on this cards because of memory issues. And it’s a big challenge to make GPU rendering fine when not all data fits video card memory and overhead caused by sending data from RAM to video card might make GPU rendering much slower. Probably using cards like Tesla will help here, but it’s a bit more expensive than dual-cpu configuration with new fancy LGA2011 processors which seems to be really promising. Oh, sorry for my post … I was absolutly not constructive (too much number before the e^^, gonzalo)but I thought you can found more cheaper solution than this. On nvidea site they was a link for a home serveur with 2 xeon + 2 tesla GPU + 16 GO RAM + motherboard + screen + case for about 16000 e.
I just thought that fermi interface which allow hight memory per cuda core would solve the problem. Fermi also allows better memory menagement in cuda threads than other cuda architecture. Since cuda 4.0 expand cuda possibilities to all that can be done in C++ (espicially classes and object oriented programation), I think that if brecht developp some tiled bvh to dispatch the tasks to cuda core, it would work well. I think they ever use this in octane or in the new nvidia renderer. The tesla cards with ECC, impressive big cache (up to 16 Go for a single card) and hight speed bus can solve all the problem you got. So do you guys thinks u can ask nvidia for a gold sponsorship ? If so you have to start a global conversion to make a full cuda and/or opencl blender (thats a jalk, but if at least particules, smoke and fluid can benefits from that, it would help you a lot). Ps : for me it sure that fermi based cards that handel giga per second for numerical simulations wouldn’t have any problem to tackle with the footage even if 4k. The question is: will this fancy computer from nvidia be 20x faster than one our node? We don’t want to reach maximum speed of a single node, we want the whole animation rendering be as fast as possible with affordable costs. I mean for sure our single node is not as uch fancy, but there are 4 dell nodes and 16 nodes in justacluster and they all together are a bit cheeper than one dual-xeon dual-tesla system you’re mentioning and i’m not sure it’ll render animation at least in the same time as our current farm. Will the JustaCluster undergo some changes? It looks like these hardware configurations are good enough for BI (CPU compute), but a bit tight for Cycles (GPU compute)? Do you plan evolution if Cycle is finaly chosen ? Couldnt you just compound renders between various GPU’s and then composite? Not actually sure i got you correct, but rendering even small peace of frame might requite the whole scene database loaded into video card. For example when you’re using reflections. mmh… so this casts new light to the direction Cycles will go over next months, if you really want to render mango using cycles it’s time to leave behind the immense effort and a lot of time needed to assure 1:1 gpu compatibility with what can be achieved with a pure cpu approach, am I far from truth? We are in direct contact with AMD about the ATI opencl progress. The ball is really on their side first… next to that, Apple also makes their own OpenCL. Iḿ working in a i7 workstation, 12Gb of ram, with a 275 nvidia card. Next week the nvidia card is to be upgraded to a Quadro 2000. Reading this blog is not clear to me if really this upgrade benefits me a lot for 400 bucks! Instead I think the Quadro gives a better stability and better OpenGL support. Whatś your advice about Quadro and Blender? Does the price tag justifies the upgrade? Thanks for all your excelent work! What OS and video driver use on your machines? Where do the network cables come together and how do they run through the Institute? And will all servers/switches/render nodes be in one room this time? There’s 3-4 switches in the studio now, with a number of routers, I lost precise insight in the exact workings. What kind of 10 Gbit connection? SFP? And is the switch seen on the picture posted by Sergey the farm switch? Eeh.. Can’t actually answer what exactly it is at this moment. It was set up before i’ve arrived. Switch form the photo isused to connect 4 dell nodes to a server only. Studio switch and some extra internet modem are in different places. Sounds like you are progressing well with the hardware. Can I ask why you have chosen Quadro 2000 cards? – You only have 192 cores on these devices and they probably cost a fortune? Would a GTX 460 not have been better? Even my SE version has 228 cores and was really cheap! 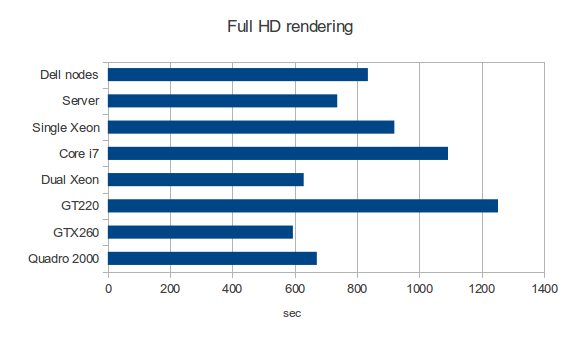 – Cycles is really quick on this card and even quicker on the full fat 460GTX (Not SE). – Surely realtime previews would be smoother on faster & cheaper cards? 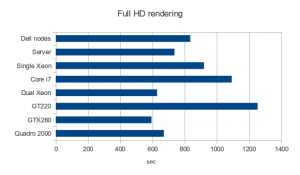 How is the render farm configured with respect to software? Are you using Blenders internal network render or are you developing something new/using open source render queue manager? Will the render farm configuration be included on the DVD set like previous releases? Can’t wait to see the final movie, should be epic. Keep up the good work on this massive task!!!! We didn’t actually choose anything :) This systems were provided us by HP. About renderfarm.. basically we’re using the same system as for Sintel, with some minor tweaks. Not sure, but think it’ll be included on DVD. What model and size of displays do you use? 2 x Eizo FlexScan S2433WFS-GY 24″ ? gr8 work….good ispiration all round……..
All ur scenes require high amounts of gpu memory maybe saphire 7970 6gb would be a solution………..
By ure selves. …..ps ud have more money for beefier gpus like quadro 6000 or even tesla/or even quad sli 580…….. Wonderful web site. Plenty of helpful information here. I’m sending it to a few pals ans also sharing in delicious. And certainly, thanks in your effort! Very impressed with project mango thus far. If I may, I do just have a quick question or two about the render farm. What software are you using to power the renderfarm? I was also wondering if blenders integrated network render feature is still being worked on and if you think it’ll ever be at tad more friendly? (dumbed down so someone like me can just install multiple copies on a renderfarm and hit “network render” on one pc and have it done).